The first—and so far only—broad-based tax proposal in the Alaska Senate was submitted today by a Republican. 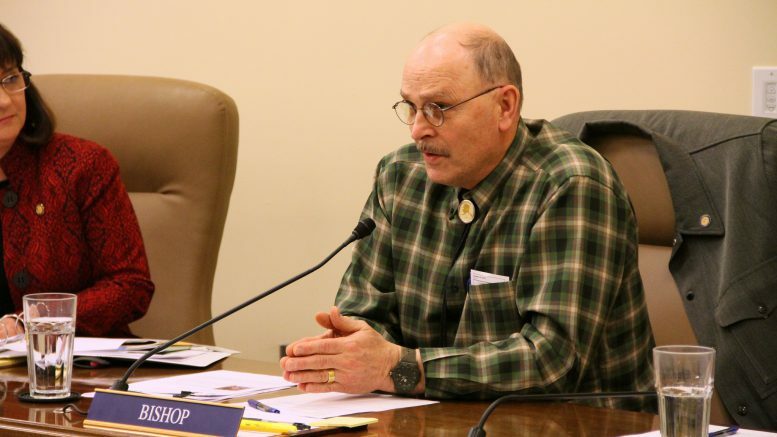 Fairbanks Republican Sen. Click Bishop, a labor-friendly moderate who’s not been shy about backing revenue measures, today reintroduced legislation that would bring back Alaska’s education head tax. Senate Bill 50 proposes collecting a $30 tax from every worker who earns wages in Alaska regardless of their residency. The revenue—an estimated $13 million per year—would be tagged for use on school construction and maintenance projects. It’s the second education-focused revenue project backed by Bishop. Alaskans will be able to participate in the Alaska Permanent Fund’s education raffle this year thanks to legislation authored by him last year. Alaska had such a tax on the books from 1919 to 1980, when the at-the-time $10 per worker tax was repealed along with the state’s income tax. The proposed tax would be deductible from federal income taxes. The new legislation—like the old—would run into problems with the Alaska Constitution’s prohibition on dedicated funds, which means that even though the law could separate the funds to go to education projects it would be on the Legislature to keep its hands out of the money. It’s estimated to raise about $13 million per year. Unlike his Republican colleagues—some vowed to meet new taxes with “mocking laughter”—Bishop has not been afraid to put forward taxes. He offered a bracketed education tax in 2015. Though the $30 tax on all Alaskans is likely to meet criticism for being regressive when comparing its impact on rich and poor Alaskans, it’s still the first and only broad-based taxation proposal put forward by either party in the Senate. Sen. Bill Wielechowski, D-Anchorage, has put forward a bill dealing with oil and gas taxes and credits. As Alaska’s struggled to grapple with getting its year-to-year budgeting under control, it’s meant skeleton-thin capital spending budgets with just enough money in them to match whatever federal funds are on the table. There hasn’t been money for the many projects legislators label as “wants not needs,” but it’s also meant that funding for maintenance of Alaska’s public facilities, including schools, has all but dried up. That’s created mammoth backlogs of maintenance projects throughout the state that policymakers, for the most part, have been more than happy to ignore while the problem only gets worse. At the Fairbanks North Star Borough, former Mayor Karl Kassel took this issue head on in his final year on the job, shining a light on a $400 million backlog driven by diminished state spending. The options for Alaskans are similar to what we’re facing on the state scene: Either pay taxes or cut services. Bishop’s bill is only estimated to bring in an estimated $13 million per year so the full mountain of school projects will likely need separate attention, but it should serve as a baseline to help keep things in control well into the future. Be the first to comment on "Republican Sen. Bishop proposes bringing back education head tax"